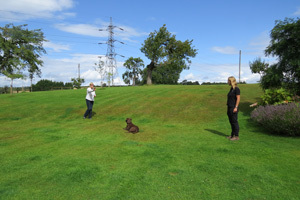 1-2-1 dog training lessons are available in Worcestershire, and by arrangement, Pauline can travel to Herefordshire, Gloucestershire and Shropshire. These dog training sessions can be carried out in Pauline?s home, your own home or a suitable alternative venue, such as a Park. Dog training for people with New Puppies These can be for those who have never owned a puppy before, haven?t owned a puppy for a while or just want some tips to ensure they get the early weeks with their puppy right. Pauline can cover house training, diet, prevention of problems, advice on equipment and toys, advice on socialisation and basic commands. Basic Training for older Dogs can include walking on the lead, basic commands, advice on behaviour management/setting boundaries; such as attention seeking and jumping up? Recall Lessons prevent recall problems by learning how to teach your dog to come back to you reliably or work on an existing recall problem. Rescue Dogs often come with problems due to their troubled past. Pauline can assess their behaviour for you and help them to settle quickly into their new environment and devise behaviour modification programmes for any existing problems. Common problems seen in rescue dogs can include separation anxiety, general nervousness, problems with other dogs and attention seeking behaviours. Other lessons include 1-2-1 clicker training, or advanced obedience for anyone who wants to progress their dog?s obedience and develop the relationship they have with their dog. A one hour 1-2-1 consultation held at your home location. This is appropriate for minor behavioural problems that can be quickly resolved with some basic advice and training tips. For more serious problems, Pauline offers a two hour consultation on veterinary referral. A full history will be taken, and then a behavioural modification programme will be devised. This will be fully explained at the consultation, but also confirmed in a written report to the client, and the referring veterinary surgeon. Follow up support is available either by phone or email, and occasionally a follow up consultation may be appropriate. Please download our veterinary referral form which needs to be completed by your veterinary surgeon and then returned to the address on the form. These are just some of the problems Pauline regularly deals with. For further advice or to discuss your individual training needs, please telephone or email Pauline. Pauline sees each owner and dog combination as a unique combination and work within each of your needs and abilities to resolve problems. 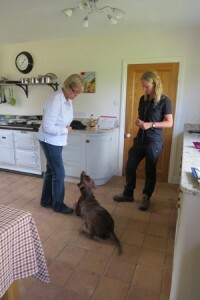 She uses a range of positive techniques tailored to the individual case to progress you and your dog. On occasion she may recommend that your dog is seen by a vet initially to rule out any underlying medical problem.